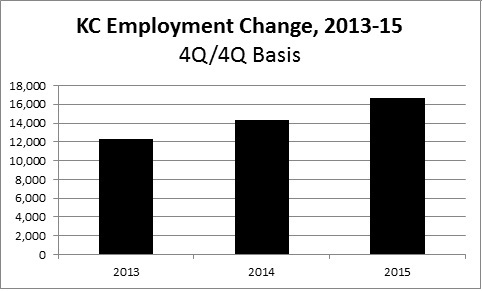 Although it may not feel like it, our economy (both U.S. and local) is well into its fourth year of recovery. Since the Great Recession ended in June 2009, the national economy has grown just over 9 percent. 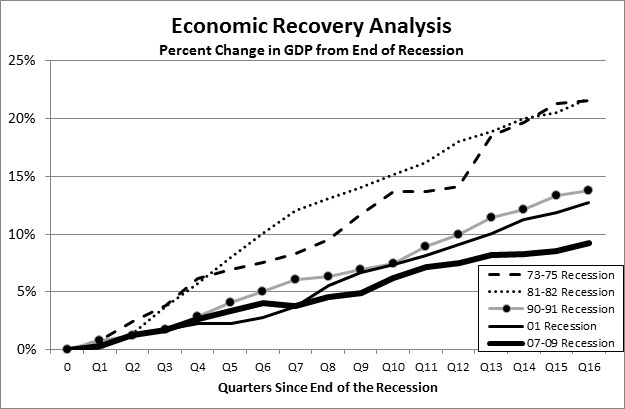 That IS a recovery, but compared to other recent recoveries, it is a timid one. Growth is not being felt uniformly across the economy, however. Some sectors are doing well while others are not. On the up side, corporate profits have increased 48 percent since the start of the recession. Business loans and the Dow Jones Industrial Average have also erased the losses incurred during the recession and gone on to experience growth. 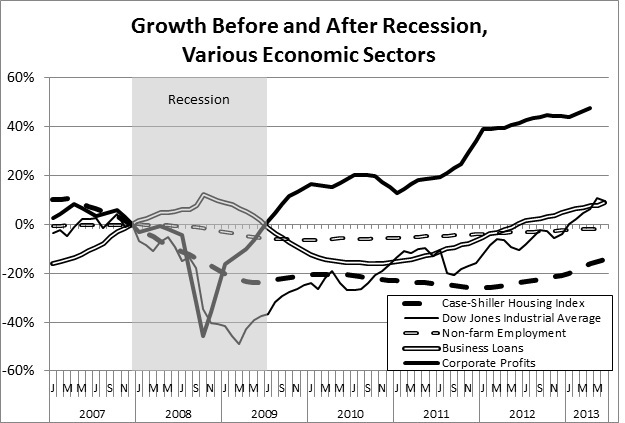 Meanwhile, employment has been sluggish, , and is just now approaching pre-recession levels. The housing sector continues to lag. Home prices, as measured by the Case-Shiller Price Index, are still 14 percent below pre-recession levels. This is not too surprising, considering inflated home prices contributed to the recession in the first place. With housing, though, prices have been trending upward over the past year nationally, and we have seen evidence of similar price increases here in the Kansas City area as well. So, it is in this up and down environment that we take a look at our local economy and forecast the next few years. 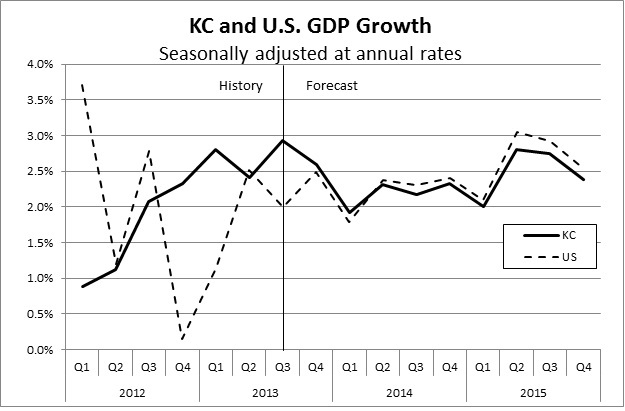 After lagging the nation throughout most of the recovery, we expect the Kansas City economy to get back on track with the national average in 2014 and 2015. Unfortunately, this still means only modest improvement, with an average growth of 2.2 percent and 2.5 percent in 2014 and 2015 respectively. This will translate into real employment growth in the forecast period, with just over 14,000 new jobs in 2014 and nearly 17,000 new jobs in 2015. Most of this growth will occur in the services sector of the economy — specifically in the Professional-Scientific, Administrative Support, Health, and Food-Drinking Places categories. Of these four sectors, only one (Professional-Scientific Services) is considered highly paid. Bottom line, we can expect the recovery — or perhaps we can just call it an expansion now — to continue at a slightly higher rate over the next two years. At least that is our view as of late September 2013. With any forecast, however, it is important to expect the unexpected. As of this writing, the country is bracing for a potential government shutdown. This would undoubtedly have a negative impact on the economy. Even if we dodge that bullet, the debt-ceiling debate in October could lead to a more serious threat to the economy. But it’s not all gloom and doom. There are other factors that could prompt a rosier economic performance for Kansas City in the next two years. 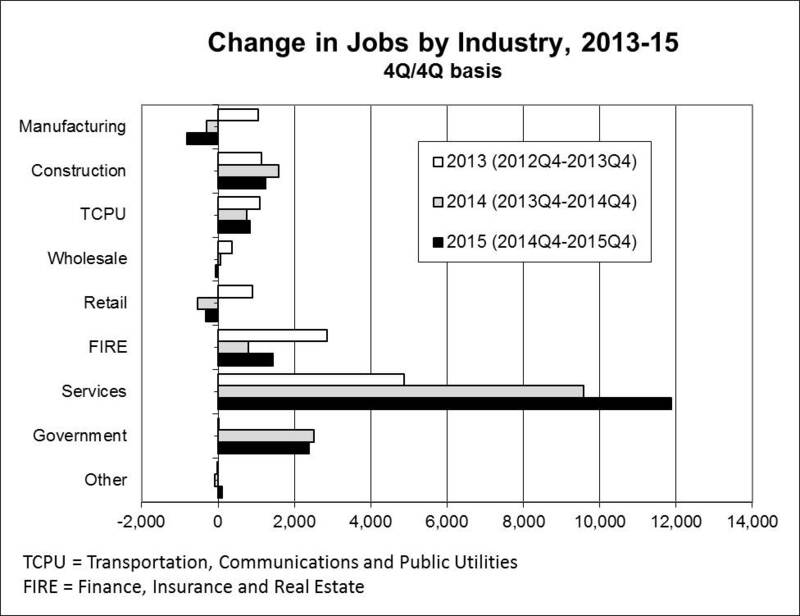 We have talked about the growth in Kansas City’s manufacturing sector in recent posts. We have also discussed how construction should pick up with an improving housing market. And we have solid growth in the IT sector, giving Kansas City a foothold in the next “new” economy. The national economy gives us a solid benchmark, but there is always potential for Kansas City’s economy to outshine the rest and be an economy that leads the nation, not one that just keeps up. The full version of the forecast is available here.